Or . . . You can't fool me, there ain't no sanity clause. This appeared over at Slashdot. Effectively, they've has gotten a patent for a sanity-loss mechanism in a video game, something that been used in RPGs for decades. I'm going to stand over here and watch Mystical Forest's head explode as two of his favorite subjects - Call of Cthulhu and computer tech, collide in a squamous, foetid, rugtose heap. On the other hand, you want some good military news? Have some here. I always knew Canlis was a class act, top to bottom. So it has become an eratic tradition that on my birthday I get away from the house and do some hiking. On my 45th, Kate went to Mt. Rainier, and starting at Paradise and went up the side of the mountain as far as you could without a back-country permit. This year (My four-dozenth, for those keeping score), we went after Little Si, in a minivacation that mixed oppulence with hiking. Because, the Lovely Bride determined, I really needed to mellow out. Little Si is located just east of North Bend, which was used for some of the shooting of Twin Peaks. We stayed at the extremely posh Salish Lodge, just west of North Bend. The lodge is located at the head of Snoqualmie Falls (The hotel in the show? That's the one). Its all of about 45 minutes away from home but was very much another world. This is one of those posh resorts with spas and incredible (and expensive) menus and the works. We got what could have been the best room in the place (top floor, close to the falls), and kept the windows open all night to listen to the rushing water. If anything, the resort may be operating at a higher level than most of its clientele. You may have met some of these guys before in your own travels. The family with four kids that would be hard-pressed to handle a night out at Denny's, much less a resort resturant. The guy in the funny message T-Shirt dining with his wife at the romantic rooftop cafe. And the clown with the thundering voice in the "silent rooms" of the spa that has to talk, ignoring all the signs around him asking not for just quiet, but silence ( a couple of the other spa users pointed that out to him, and he thought they meant "Keep talking, but do it softer"). Despite this, it was a first class operation and an incredibly pleasant weekend. The food was fantastic. And Kate decided that after all these years, I should get a professional massage. Warm oils. Hot stones. Strong hands. Meltably excellent. And Dusty, who was playing old folk music at the Attic, reminded me that not all the music of my youth was the horrible pap that gets recycled on Jack-FM. Saturday we hiked up Little Si, the smaller of the "twin peaks". It was about a five mile hike, up and back, with a rewarding view of the valley below from the top. The trail was a bit steep in places, and the Lovely Bride had trouble coming down (she was wearing lightweight hiking shoes that passed on every bump and root, and I had to help her down off some of the larger drops (as small children were bouncing down the mountainside around us, giggling). But it was a wonderful trip, and very nice birthday present. Needless to say, I did mellow out. So I have some new fiction on the web, at the Legendology Site of Wizards of the Coast. Legendology is an online short fiction anthology, some of which support existing games (Like Hecatomb or D&D) while others are new things that may and may not turn into something larger. The stories I am writing are in that latter category, and are part of a series called The Irreverents. It is godly fantasy with a bit of a twist. I am having fun writing it, and it is letting me indulge in my less-serious side (not to say parts aren't very serious, indeed). Take a look. They even have an message board for it, though I admit I will check it only infrequently. 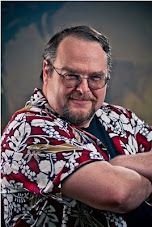 I didn't go to GenCon this year, but Peter Archer informed me there would be a testimonial to Ed Greenwood, founder of the Forgotten Realms (I take co-creator bows only as far as it being a campaign setting - He was the architect, I was the engineer). If all went well, then last night there would have been a large number of people listening to anecdotes, roasts, and kind words directed at Ed. Peter asked me if I wanted to put something down to be read aloud to my partner in crime. It's been twenty years already? Actually, it's been more than twenty years. You've been building the Realms since you were, what, eight? And it was twenty-plus years ago when I opened my mouth and got us into this mess. Here's what happened (for the benefit of those assembled here). Twenty-Plus years ago, Management was afraid that Dragonlance would be a flash in the pan. OK, stop laughing. They were serious. They were honestly asking the question: What would come after Dragonlance? And, young naif that I was at the time, I pointed out that you had been writing articles for DRAGON, mentioning the Realms and its chief wizard, Elminster. Maybe there really was a world behind all this. Would they want me to check? The rest, as they say, is Hysteria. Had I but known then what I know now, I would have fled into the night. Instead I got reams of your notes and descriptions, wrapped in that heavy vinyl-like Canadian plastic wrap that they use up there for riot gear. Wrapped, re-wrapped, and wrapped again. At one point, I was spending an hour a week just unwrapping your notes. We used the discarded wrap for shingles, and hundreds of Wisconsin families thank you. In addition, these were written on your ancient "Flintstone-era" typewriter, which was missing the "T" key. So you would go over the manuscript afterwards with a ball-point, drawing in the "T"s. The end result looked like a little graveyard on the page. And, in the days before "Cut-and-Paste" computer technology, you would literally cut up your notes and paste them back together, then photocopy the result. This would create, interesting pages where the text would travel along the bottom of the page, then up the sides in the margins, and then flip over on the top of the page. And yet, despite it all, we managed to distill all of Elminster's notes into a single great grey box and release it on an unsuspecting world. And I have to say I am proud of it after all these years. I am proud of Shadowdale and Waterdeep and Westgate. I am proud of making the gods and priests cool (though every time someone tries to simplify the pantheon, we end up with more gods than when we started). I am proud to have worked in this world. I am proud of the great art we got out of the TSR bullpen. I am proud that I convinced Clyde Caldwell to draw a woman in full plate mail for once. I am proud of Karen and Julia and Steven and Doug and everyone who has built upon the Realms. I am proud that to have hosted the "Elminster's Notes" panels at GenCon for so many years, and kept a (mostly) straight face. And I am proud that so many people have enjoyed and still enjoy what we put together twenty years ago. I am proud of the foundation we created. I am proud of where it has gone. Congratulations on the past twenty, Ed, and here's to the next twenty. In other GenCon news, the ENnies, Gencon's version of the Origins awards were given out. Ars Magica, which took best RPG for the Origins Awards, took the "Best Rules" ENNie (its always nice to be have your own choices backed up), but more importantly, a double fistfull of awards went to some of the gang on the righthand side of the page, in particular Monte, Nikchik, and Chris. The ENnies are supported by EN World, but here's a full list and a couple photos here. Congratulations to all! Last night, my youngest daughter and I attended a candlelight vigil for Cindy Sheehan. Cindy's son died last year in the war on Iraq, and she's presently camped outside George Bush Jr.'s ranch, asking that he talk with her. Our vigil was one of over 1600 across the nation, attended by more than 100,000 people in total. Having never been to this sort of thing before, I wasn't sure what to expect. Would we be marching? Would we be pelted with eggs? The invitation said only "bring a candle and a placard" and "there will be no speeches." All I knew was that I hoped my attendance would encourage other people to stand up for their beliefs, popular or not. As it turned out, our vigil was simply a gathering in the backyard of a modest home on a secondary street in town. There were 70-plus people in attendance, aged 9 or so to 92, in a circle of lawn chairs facing a table with a few flowers. Our host explained that she had sympathized with Cindy's grief, but she hadn't felt motivated to act until she heard people criticizing Cindy as un-American. Hosting this vigil was her way of encouraging other people to speak out as well. We were invited to come forward one by one, light our candle, and say a few words. "Please keep it short and positive," was the exhortation. The words spoken were of hope for the safety of our troops, of sympathy for the Iraqi people, and of the need for the human race to grow up. As each person spoke, I was struck by how diverse a group of people this was--so typical of America. And I felt proud to be partaking in this American tradition of freedom of speech. Waving a flag is easy. Speaking up in the face of opposition is not. But that is exactly the obligation of liberty. As my daughter and I drove home afterward, she talked about the difficulties she faces at school, the pressure to conform. She thanked me for the chance to meet adults dealing with the same pressures in a larger venue. And she thanked me for teaching her to think for herself. As her father, I might sometimes wish she were a little less independently minded. But then again, that's what liberty is all about. So I encourage you: Whether you agree or disagree with this war, speak out. Keep the dialogue alive. And please remember Cindy Sheehan as she asks our current President to speak with her, as well. Until I started working up here in the Olympian Heights of Bellevue, I never thought about how much the comic book industry depends on a depressed commercial real estate market. For as long as I've been out here, downtown Bellevue has always been trapped in a weird transitional phase. It has a scattering of big shiny office buildings and a humungous mall, but a lot of the land is still low-rise urban - one and two-story mini-malls, broken by the occasional former private residence that became a law office and then a used car lot and then an abandoned building with weeds popping up through the asphalt. But the wavefront from the bursting of the Internet bubble (and with it the drop in the immediate need for office space) has swept through, and construction is booming here. In addition to the big hotel/apartment complex going up (shown in the last entry), there is a "superblock" going up just north of here, and Matt's Famous Hotdogs, a local joint that used to be a gas station, is coming down for another big shiny structure. Everything under two stories high seems to be targetted for removal. And looking at all the construction, I am struck by the fact that the East Side doesn't have a decent comic book shop. Nothing in Bellevue, or Redmond. Our Art Director has some friends who had a shop in Kirkland, but that just shut down. He's going to the U-District for his comics fix, and I still make Bookworld my stop, braving road construction to do so. Now, Bellevue is near Geek Central (Microsoft, as well as a cascade of smaller companies), so you think that a comic store would be a no-brainer. Yet no comic book shop has made the cut here. I think its because of the requirements of brick-and-mortar comic stores combined with high rents. Comic stores need space, and a lot of it. Comics themselves are relatively slender things, but put years and years of back-issues together, and they become huge, lumbering things. So comic stores are space-intensive. And space costs, particularly on the East Side. This is nothing truly new - almost all of my comic stores over the years were in areas I would term "distressed" if not "depressed". The North Side of Pittsburgh. The Oriental Theater area of Milwaukee. Downtown Renton. Places where you can get a fair amount of space at a fairly cheap rent. Former carpeting stores in particular account for about half of the "previous owners" of the stores I've haunted. And that makes sense, since carpet stores also are a high-inventory, space intensive retail outlet. And that's why no comic stores on the Eastside. Even with slumps in commercial development, it has never gotten to the point where the landlord would grab onto any tenant. It would be easier to put the land up for resale for the eventual office building or condo. You have to go to Renton, Kent, and Burien for the prices to come down to the point that it will work. And even then, its a touch-and-go operation. Economic prosperity, odd as it sounds, may be a bad thing for your Local Comic Book dealer. Finally, in other comics-related news, my old artist from the days of Forgotten Realms comics, Rags Morales, now has a blog. He's posting art and interviews. So go check him out. I've been meaning to post these for a couple weeks, but with one thing and another, haven't gotten to it until now. For those who have been hanging about the site, you know I have picked up a contract gig with Pokemon-USA, situated in one of the skyscrapers that now dominate the Bellevue Skyline. The company moved in after the dot-coms went casters up. and there were a lot of empty buildings at that time in this neck of the woods. Here's what the building looks like. It used to be called the Rainier Plaza but has been renamed for its new major tenant. Nice looking digs, you have to admit. Here is the recently-redone lobby. The marble is imported from Italy and what looks like artpieces at the left-hand side are really a trio of flatscreen plasma TVs running a continual loop of scenes. This is the view from our conference room, looking west. The big tall structure is another major skyscraper under construction (hotel on the lower floors, luxury condos on the upper ones). The big flat structure behind it is the Bellevue Square Mall. The big blue thing behind THAT is Lake Washington. And those buildings far in the background? Downtown Seattle. And on the horizon, the Olympic Range across the sound. Yeah, its a heckuva view. But I'm thinking of wearing a tie, just to avoid stares on the elevators. So I've been driving around a lot more of late, initially as part of the job search and now as part of the long haul up and back to Bellevue. And I'm listening to a lot of radio. Let talk about other radio stations first, before settling down to my subject at hand. At home, the stereo is mostly tuned to KPLU (88.5 FM), mostly for its jazz, but I don't listen to it as much on the road. I tried to listen to Jack-FM (96.5 FM here), a random-roll, robot-radio station that ditched their DJ talent, only to be left with the reminder that most corporate pop radio of the last quarter-century is pretty crappy. Infinitely superior is local KEXP (90.3 FM), which plays what is a really eclectic mix (Johnny Cash, Billie Holiday, Hendrix, and Gorillaz all in one day)[UPDATE: And you can stream it live at KEXP.org]. And KING (98.1 FM) is an honest-to-goodness classical station supported by real sponsors. I've been listening to the Mariners (KOMO 1000 AM), which is an exercise in futility that gives me bonding with friends who live in Chicago and Pittsburgh. And I've been listening to Air America (1090 AM). You can't really say "local" Air America, because as yet they haven't ponied up for a local show, but it's supposed to be coming. The first thing with Air America you need to address is the oft-repeated media lie "Al Franken is just Rush Limbaugh for the Left". Sorry, you can't listen to Al for more than five minutes without debunking that one. Franken is a warm, affectionate radio personality, two parts Garrison Keillor and two parts favorite uncle. And while he doesn't have Limbaugh's bluster and bloviation, thought he does use lot of the same tactics that Fox News has made famous. Franken is open about his political leanings but claims fairness. He will have conservative guests on, but he outnumbers them, backed up by his female sidekick and sometimes another progressive guest. Like early Fox, Franken is more than willing to let on conservatives, who proceed to hang themselves with their own tongues, letting Al look safe and sane and rational. Now, on the other hand, afternoon host Randi Rhodes IS Rush Limbaugh for the Left. Randi has a smoky voice made for radio, the patter of a fundy tent preacher, and a junkyard dog mentality. She fills her hours with a relentless return to her central point of the day (usually along the lines of "This Administration deserves to be thrown in jail"). Like Rush, she plays a little fast and loose with the facts (Franken usually sources his accusations), engages in chopshop audio editing of her targets, and is not above outright mockery and insult. If you're left of center, and wonder why the dittoheads always seem so twitchy, try a week of Randi. You'll be twitching too. Lastly, there is Ed Shultz, whom I would recommend to any right-of-center radio fan who wants to try out Air America, but finds Franken suspicious and Rhodes oddly familiar but too harsh. Ed is formerly a conservative talker who had his moment on the road to Damascus and switched sides but not sensibilities. What he brings is both a knowledge of how talk radio works (he is very good at what he does) and a common sense approach and openness that plays well in middle America (unlike Rush, he doesn't screen calls). The end result is a very accessible guy-next-door approach. Some of his message is advanced for the rest of the world (Bio-diesel and wind power), but if you come out of the reddish end of the political spectrum, he's a good place to start. Me, I think I'd more Gorillaz, please. Slow News Day . . .
. . . When this shows up on the front page of the Friday P-I. It used to be, before 24/7 newscasting on cable, that the press would hit a "silly season" in late summer. Nothing was happening, national politics were at a lull, and things like frying an egg on the sidewalk or watching dogs frollic in sprinklers or bigfoot sightings were considered front page material. Now those days are gone . . . mostly (the blog-world keeps the spirit alive with "Friday Cat Blogging", but its not nearly the same). 1) Whaddaya mean by Liberal? 2) Whaddaya mean by City? The non-partisan operation studied voting tendencies, says the article, but that seems to assume that every election is between a bonafied liberal and a certifed conservative. And a lot of candidates that are to the left on some issues would be considered to the right on others. Many would be rejected as liberals or conservatives by their own party's more hard-core wings. Recently, the Computer has been looking for traitors . . . sorry, had a gaming-moment there . . . the Administration has been looking for liberal bias in NPR, and set the standard such that conservative Republicans appearing on "All Things Considered" were considered liberal guests because they were doubting the wisdom of the Computer. I mean the Administration. The city limits are also an effect on these studies. Pittsburgh is considered #35, slightly more liberal than Madison, Wisconsin. While I don't doubt that there are a lot of left-leaning policy makers in the heart of former Steeltown USA, once you get south of Mount Washington you're in Richard Mellon-Scaife territory, with a definitely more conservative spin. Seattle ranks in at #16, and the article includes good-natured quotes from the more liberal politicians and mock-outrage from the local conservatives who sound concerned that there are more liberal places to live than Seattle. If I were them, I would demand a recount. And speaking of recounts, while I was laid low, the Best of Seattle list showed up from one of the two local weeklies. Alas, my minions (both of them) did not carry the day, and the best blog went to a Definitely Liberal political blog called the HorsesAss.Org. I for one am shocked and outraged, and demand an immediate recount. Obviously we need to examine this travesty of justice fully! Who knows? Maybe I can get the State GOP to go in with me and we can get a group discount. (With a nod of the hat to Jon Astin’s character on Night Court). I have recovered, which is to say that I am mostly upright and relatively cogent. I am still a bit dizzy and tire easily, but the current plan is to keep me functional and ride the virus through. I'm on a drug called meclizine, which has the added value of sounding like "mescaline", and creates drymouth drowsiness, and inadvertant sarcasm. I’m not a great fan of the way I’m feeling, but it is an extreme improvement over the way I was on Friday. I would have passed this along sooner, but now that I am on the mend, of course, my home Internet connection is out of whack. The lovely bride swears it has nothing to do with the fact that she was moving around on the roof working on the front overhang, but the TV feed is also on the fritz, and the Comcast rep is supposed to show up on Friday. Until then, I have been thrown back to the prehistoric days of the 1980s, where the only thing my home machines talked to were themselves. And I say that in advance to anyone who wonders why I’m not responding. I'm posting from the office, and am a bit irritated by spending “job-time” on things other than “the job”. This particular writeup is being written the night before (actually, I have a bunch of them backing up), and I will schlep in my portable tomorrow to get it uploaded. But while you’re here, you might as well continue on to Jason’s page, where he is talking about the 250 things that Mr. Welch can no longer do during an RPG. Yeah, it's funny, until it hits you square between the eyes. There are positive and negatives with a freelance/contract/temp lifestyle, but one of the big negative ones is a lack of health care. Which is all well and good as long as you stay healthy. Me, I'm the healthy one in the relationship - don't take any regular medications, just had a checkup, doing pretty good. Or so I thought. Woke up with dizziness. Had a bit of it the night before, but just thought of it as being the workload. And I have been dizzy on waking before - something out here that hits like a mild alergy. Nothing to worry about, I think. A little sweating, but that wasn't going to keep me from the job. Yeah, I'm a real Corporate Samurai. By the time I got to the job the situation had worsened. Dizziness worse, to the point of stumbling a bit. And nausea had kicked in. And about an hour into the job, vomitting. At this point, no matter how much of an Office Samurai one is, it's time to go home. So I wait for an office grown-up to show up (I don't know the sick-day procedure yet) and I start back home. I have to pull over once to vomit. Once I get home, things get worse. How much worse? So bad that I won't tell you about it here. Instead I will hold my experiences for some future time when I need to refer to them in a book. That's right - they were so bad I'm going to make people pay me money to hear about them. About fourish on Friday, drained, sweaty, and still-heaving, we put in a call to our GP. She was out, but an associate was covering, and we went in. He said there was nothing for him to do but send me to the ER. I'd like to describe in full the experience, but I was literally going through it with my eyes closed. Tightly closed, since opening them gave me a dizzying view of the universe usually seen in the camerawork on Battlestar Galactica. And I was a conundrum for the ER staff. DIzziness, but no acute pain. Tests were run. ECG, CAT scan. A machine that went ping (really). They tried giving me anti-nausea medication and were rewarded by a spectacular display of my current stomach contents. I was afraid it was food poisoning (I shared a meal with three friends Thursday night). I was afraid it was something nasty picked up at work (several co-workers had just come back from Corporate HQ in Japan). I was afraid it was something unique and personal and horribly longterm. In the end, they settled on vertigo as the most likely diagnosis. A middle ear viral infection that caused the dizziness, which in turn kicked in the nausea, vomitting, and sweats. The ER Doctor (a young man, perhaps my age), was frustrated that he couldn't hit the nail on the head, so we're doing valium over the weekend. I've spent the time since sleeping, trying to read, and doing soduku puzzles in bed. Staying horizontal is good. We're going to try to snage the GP on Monday. And this entry has consisted of my major activity for the past two days. With my recent absences, I hope you've been taking advantage of cruising the linkage on the right-hand side of the site. They're friends, whose entries vary from regular updates to lunar rotations, and whose contents vary from detailed and accessible to explicable only to close friends and relations. However, two of them in the past day have touched on the Real War and deserve promotion here. Mystical Forest has a friend who is part of a sniper team in Mosul, and checks in regularly, reporting on the good stuff (our guys grok the whole "hearts and minds" thing) and the bad stuff (the rear echelon doesn't). Go read it. Nikchik, on the other hand, covers the commute from the home front. Go read this as well. In other news, our Commander-in-Chief has started a five-week vacation. I can think of a few others who could use the break. But in the Munich Circus, I was known as . . . Still busy, but have one of those "What X-Person are you?" quizzes, gakked from Lady Gumdrop. Odd, I usually end up with The Beast in these.